More than 520 people were injured in northern Taiwan on Saturday, after fire broke out in a recreational park. The flames are suspected to have stemmed from an unknown flammable colored powder, which created an explosion after being sprayed onto a crowd. 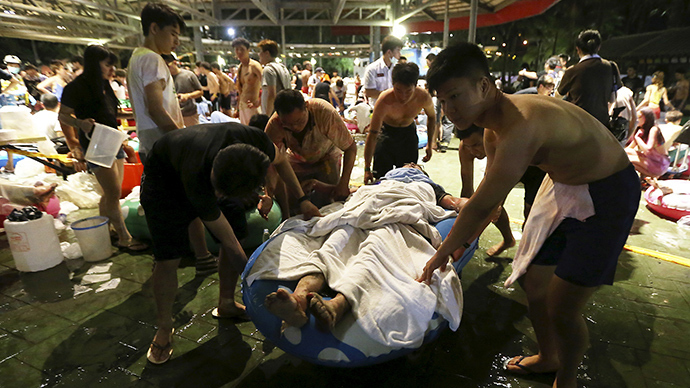 People were attending a themed ‘color party’ at Formosa Water Park in New Taipei City, when they got caught up in the inferno, news agencies reported citing local media. People were being sprayed with clouds of colored powder, when one of the substances exploded, officials said. Nearly a thousand people were near the stage when the fire broke out. “At the beginning I thought it was part of the special effects of the party but then I realized there was something wrong and people started screaming and running,” a male witness told local news channel CTI, as cited by AFP. Footage from local media showed the park being ablaze, with people running to escape. "Our initial understanding is this explosion and fire... was caused by the powder spray. It could have been due to the heat of the lights on the stage," AFP reported a spokesman for the New Taipei City fire department as saying. The injury toll stands at 524 as of Sunday afternoon, with 419 treated in 41 hospitals and 194 out of them in serious condition, CCTV reports. Meanwhile, Taiwan Premier Mao Chi-kuo told reporters that the “next few days will be a critical time for the injured,” adding that 410 people were still in hospital on Sunday, with 194 being treated for serious injuries. Some victims suffered burns to more than 40 percent of their bodies, media reports said. Many had respiratory system damage. Some victims were carried out on inflatable plastic water rings, while others were being attended to by people pouring water from bottles over them. The fire was quickly extinguished and the park closed, officials said. "We have demanded the park shut down immediately for inspection," New Taipei City mayor Eric Chu told reporters, as cited by Reuters.